By contrasting the darkness of a winding path to the sun’s shining effect on grass and leaves, and making the path mysterious, as if it is slightly spooky, slightly dangerous, this poem feels complete. It makes me want to follow the poet down the path, or stand beside the poet in the glittering sunshine, look at all the beauty in front of us, and smile. Good job, Farley! I love it! It’s a wonderful thing to know how to use words so skillfully to describe what one sees and feels… It makes me feel like I was there, too… Well written, Farley! Beautiful images, Farley, and lovely use of words to describe the sun on the path you walk. love the image on top..
the words are simple and magical at the same time! Oh woooowww.. this is lovely!!! A poet at 6!! EXCELLENT!!! Farley, you are the best!!! 😀 Keep it up! I am already your fan! 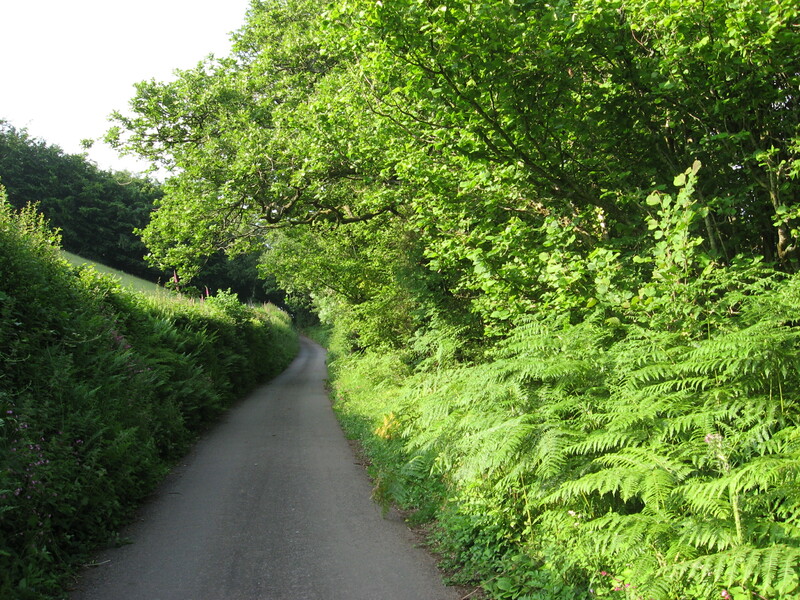 The windy lane looks so enticing… you are one lucky boy to be able to walk on such a beautiful path almost everyday! Your words exactly describe the feeling and vision that I had the other morning when I was riding my horse down a trail. It was early morning on a beautiful path, the dew was still glittering on the grass and the sky was blue. Your ability to appreciate that what is around you will add an extra special dimension to your life. Some people go through their days without seeing the beauty around them and they miss out on something very special. I hope that your ability to put into words so eloquently what you see and feel will continue. When your Granny Cindy was a little girl she wrote poems and they were wonderful. Maybe you have inherited this ability from her. P.S. Matthew loved meeting you Izzie and Raffie last spring when he visited your family. Good job Farley!! Your poem beautifully described the mystery of the lovely photo. Hi Farley, great job on the poem. You have a real talent, like your grammy. Looking forward to more of your writings. Your aunt in Orange City, Florida. Ah, now I know where the phrase comes from…”Out of the mouths of babes”. Children have so very much to teach us. Thank you, Farley. Thank you for being so nice all of you. For a 6 yr old… its a sweet poem. Farley, you will one day become a great poet. The child really has the gift for words. Amazing that he can choose just the right words to describe his impressions. Am impressed. When my daughter was a baby, I started reading to her, even before she understood words. Her father did the same, and she grew up with books – not television. We wouldn’t have a television in the house until after she learned to read. She has raised her children with that same love of books, and only occasional videos allowed (no regular TV) and it has paid off, because all the kids have amazing vocabularies and wonderful ability to imagine and communicate. I believe that one of the finest gifts we can give children, is to read to them. With brains like sponges, they hear and absorb words remarkably fast. I just wish I still had a sponge brain – there are so many words I have yet to learn! !